A mob war between crime bosses Rupert Thorne and Arnold Stromwell is nearing its end, and comes to a climax when Stromwell is set up to be killed in an exploding restaurant by Thorne. 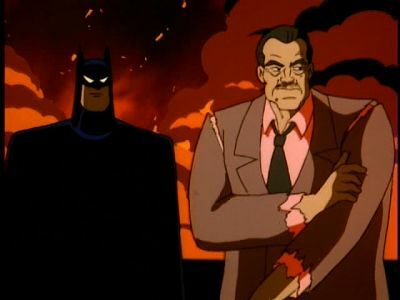 Batman saves him at the last moment, and persuades Stromwell to use his fall into disgrace to help him bring Thorne in, mostly for the sakes of his wife, his ill son and his estranged brother, as well as his own. Ein alter Gangsterboß, Arnold Stromwell, wird von einem Rivalen, Rupert Thorne, bedroht. Batman rettet Stromwell vor den Männern Thornes und versteckt den Mann unter der Nase seiner Feinde. Im Verlauf der folgenden Stunden erfährt Stromwell, daß auf Grund seiner Drogengeschäfte sein eigener Sohn in einer Entziehungsklinik endete. Uma guerra entre os chefes do crime Rupert Thorne e Arnold Stromwell está chegando ao fim quando Stromwell, está para ser morto em um restaurante explodido por Thorne. Batman o salva no último momento e ajudado pelo irmão de Stromwell (agora um sacerdote que perdeu uma perna anos antes, em um acidente cujo Stromwell carrega uma culpa secreta), tenta convencê-lo a desistir de sua vida de crime e ajudar a polícia a capturar Thorne.